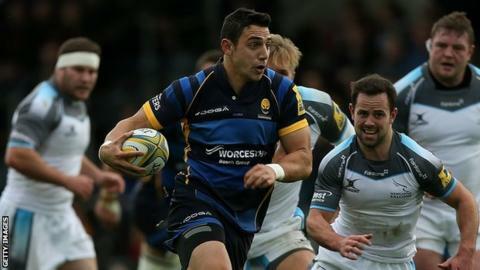 Worcester Warriors can make an impact on the Premiership this season, according to former New Zealand Sevens winger Bryce Heem. The 26-year-old made a try-scoring debut in Worcester's 28-20 bonus-point win over Newcastle Falcons. "We feel we're contenders in this Premiership - we're not playing just to stay in it," Heem told BBC Hereford and Worcester. "We're playing to win and we'll turn some heads doing it." Heem, who won silver with the All Blacks Sevens side in the 2014 Commonwealth Games, agreed to move to Sixways from Super 15 side Chiefs in April, but missed the first three games of the season to finish his rugby commitments in New Zealand. "I spoke to (Warriors director of rugby) Dean Ryan before I came here and it was definitely something I wanted to get involved with," he said. "I've been here about a week and a half, but am settling in well." After their opening-day win over Northampton, Warriors lost at Sale and Gloucester before returning to winning ways against the Falcons at Sixways. And Heem is hoping Worcester's progress can emulate the success he experienced during his time with second-tier Tasman in New Zealand, when the club won promotion to the top flight and became an established side. "Tasman were in the Championship and made their strides into the Premiership and are one of the firm contenders," he added..
"Hopefully, we can do the same with Worcester."